Market : Market is a place in which buyers and sellers come into contact for the purchase and sale of goods and services. Market structure: refers to number of firms operating in an industry, nature of competition between them and the nature of product. Perfect competition: refers to a market situation in which there are large number of buyers and sellers. Firms sell homogeneous products at a uniform price. Monopoly market: Monopoly is a market situation dominated by a single seller who has full control over the price. Monopolistic competition: It refers to a market situation in which there are many firms who sell closely related but differentiated products. Oligopoly: is a market structure in which there are few large sellers of a commodity and large number of buyers. Very large number of buyers and sellers. Firm is a price taker and industry is price maker. Single seller of a commodity. Absence of close substitute of the product. Difficulty of entry of a new firm. Large number of buyers and sellers but less than perfect competition. Freedom of entry and exit. Large number of buyers and sellers. Free entry and exit of firm. Equilibrium: It means a position of rest, there is no tendency to change. Market equilibrium: It means equality between quantity demanded and quantity supplied of a commodity in the market. Equilibrium price: This is the price at which market demand of a commodity is exactly equal to the market supply. Market demand: It refers to the sum total demand for a commodity by all buyers in the market. Ans:- Perfect competition is a market with large number of buyers and sellers , selling homogeneous product at same price. Ans: Monopoly is a market situation dominated by a single seller who has full control over the price. Ans:- It refers to a market situation in which many buyers and sellers selling differentiated product and have partial control over the price. Under which market form firm is a price maker? Ans:- Oligopoly is defined as a market structure in which there are few large sellers who sell either homogenous or differentiated goods. In which market form is there product differentiation? Ans:- Monopolistic competition market and oligopoly market. Ans: It means close substitutes offered by different producers to show their output differs from other output available in the market. Differentiation can be in colour, size packing, brand name etc to attract buyers. What do you mean by patent rights? Ans:- Patent rights is an exclusive right or license granted to a company to produce a particular output under a specific technology. Ans: – It refers to charging of different prices from different consumers for different units of the same product. What is the shape of marginal revenue curve under monopoly? Ans:- Under monopoly market MR curve is downwards sloping curve form left to right and it lies below the AR curve. What do you mean by abnormal profits? Ans:- It is a situation for the firm when TR > TC. 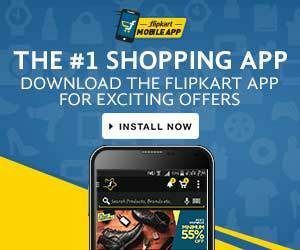 Why AR is equal to MR under perfect competition? Ans:- AR is equal to MR under perfect competition because price is constant. Ans:- Advertisement cost are the expenditure incurred by a firm for the promotion of its sales such as publicity through TV , Radio , Newspaper , Magazine etc. Ans:- Short period refers to that much time period when quantity of output can be changed only by changing the quantity of variable input and fixed factors remaining same. Ans:- Long period refers to that much time period available to a firm in which it can increase its outputs by changing its fixed and variable inputs. Ans: Market period is defined as a very short time period in which supply of commodity cannot be increased. What is meant by normal profit? Ans:- Normal profit is the minimum amount of profit which is required to keep an entrepreneur in production in the long run. Explain any four characteristics of perfect competition market. Large number of buyers and sellers : The number of buyers and sellers are so large in this market that no firm can influence the price. 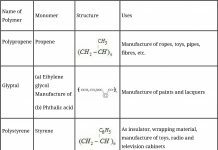 Homogeneous products: Products are uniform in nature. The products are perfect substitute of each other. No seller can charge a higher price for the product. Otherwise he will lose his customers. iiU Perfect knowledge: Buyers as well as sellers have complete knowledge about the product. iv) Free entry and exit of firm: Under perfect competition any firm can enter or exit in the market at any time. This ensures that the firms are neither earning abnormal profits nor incurring abnormal losses. Explain briefly why a firm under perfect competition is a price taker not a price maker? Ans:- A firm under perfect competition is a price taker not a price maker because the price is determined by the market forces of demand of supply. This price is known as equilibrium price. All the firms in the industry have to sell their outputs at this equilibrium price. The reason is that, number of firms under perfect competition is so large. So no firm can influence the price by its supply. All firms produce homogeneous product. Distinguish between monopoly and perfect competition. Single seller of the product. Due to price discrimination price is not uniform. Very difficult entry of new firms. Which features of monopolistic competition are monopolistic in nature? What are the reasons which give emergence to the monopoly market? Ans:-i) Patent Rights: Patent rights are the authority given by the government to a particular firm to produce a particular product for a specific time period. Formation of Cartel: Cartel refers to a collective decision taken by a group of firms to avoid outside competition and securing monopoly right. Government licensing: Government provides the license to a particular firm to produce a particular commodity exclusively. Explain the process of price determination under perfect competition with the help of schedule and a diagram. Ans:-Equilibrium price is that price which is determined by market forces of demand and supply. At this price both demand and supply are equal to each other. Diagrammatically it is determined at the point where demand curve and supply curve intersect each other. At this point price is known as equilibrium price and quantity is known as equilibrium quantity. When will equilibrium price not change even if demand and supply increase? Ans:- When proportionate increase in demand is just equal to proportionate increase in supply. Equilibrium price will not change. It can be shown in the following diagrams. 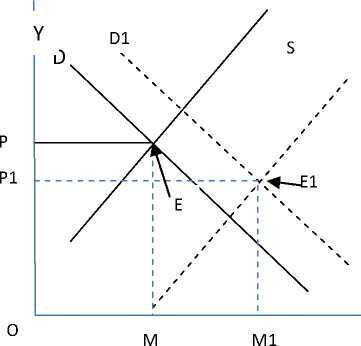 In the above diagram increase in demand is just equal to increase in supply. 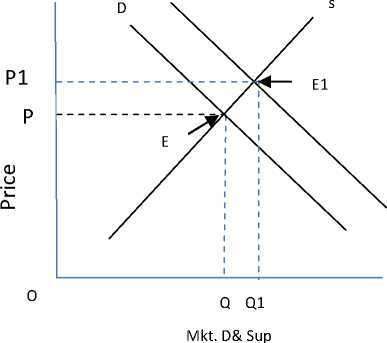 Demand curve shift from D to D1 and supply curve shift from S to S1 which intersect at point E. Thus equilibrium price remain unchanged at OP though equilibrium quantity increased from OQ to OQ1. How does increase in price of substitute goods in consumption affect the equilibrium price of a good? Explain with a diagram. Ans:- An increase in price of substitute goods (coke) will cause increase in demand for its related goods (Pepsi) . The demand curve for Pepsi will shift to the right side. The supply curve of Pepsi remains the same. It will lead to an increase in equilibrium price of Pepsi and increase in quantity also. How does the equilibrium price of a normal commodity change when income of its buyers falls? Explain the chain effects. This leads to competition among sellers to reduce the price. As a result demand starts rising and supply starts falling. These changes continue till a new equilibrium price is established where demand equal supply. Why is the demand curve facing monopolistically competitive firm likely to be very elastic? Ans:- It is because the product produced by monopolistically competitive firms are close substitute to each other. If the products are closer substitutes to each other the elasticity of demand is high which makes the firm demand curve is elastic. Show with the help of diagram the effect on equilibrium price and quantity when supply is perfectly inelastic and demand increases and decreases? When supply is perfectly inelastic and demand increases. Demand curve shift to towards right. 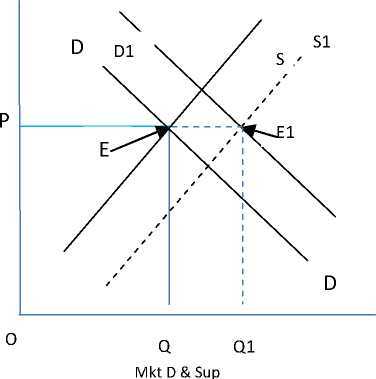 The new demand curve D1 intersects the supply curve at point E1. Result : Price increases from OP to OP1 and quantity demand remains unchanged. 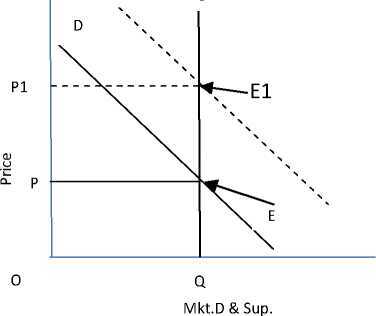 In the above diagram demand curve shift left wards from D to D1 Price falls from OP to OP1 , but quantity remains same. Explain the implication of free entry and free exit of a firm in perfect competitive market. Ans: – If there is free entry and free exit of firms, then no firm can earn abnormal profit in the long run (firm earn zero abnormal profit). Each firm earns just normal profit. 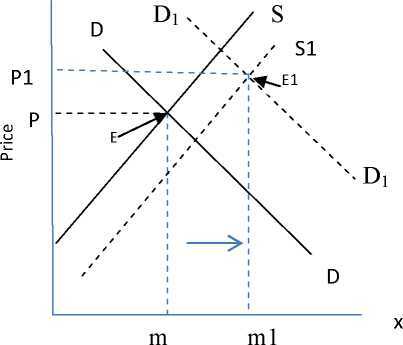 Equilibrium price may or may not change with shifts in both demand and supply curve. Comment. Ans:- There can be 3 situations of a simultaneous right wards shift of supply curves and demand curves. When demand increases more than supply price and quantity both will increase. When increase in demand is more than increase in supply price increases from OP to OP1. 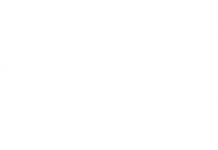 Quantity increases from OM to OM1. Increase in price is less than increase in quantity. When demand increases less than supply, price will fall but quantity will rise. M kt . 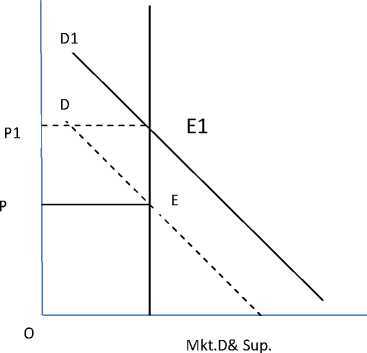 D & Su p.
When supply increases more than demand price falls from OP to OP1 and quantity demand i: y ases from OM to OM1. Decrease in price is less than increase in quantity. 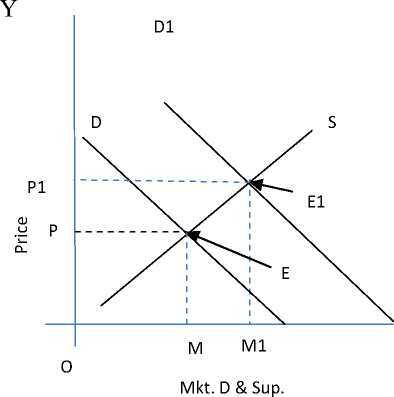 i) When demand and supply increases equally then equilibrium price remain same. When increase in demand is equal to increase in supply price remains unchanged at OP. Quantity exchanged increases from OQ to OQi. Distinguish between collusive and non-collusive oligopoly. Explain the following features of oligopoly. Ans:- Collusive oligopoly is one in which the firm cooperate with each other in deciding price and output. Non collusive oligopoly is one in which firms compete with each other. Few firms: There are few sellers of the commodity and each seller sells a substantial portion of the output of the industry. The number of firm is so small that each seller knows that he can influence the price by his own action and that he can provoke rival firms to react. Non price competition: The firms are afraid of competition through lowering the price because it may start price war. Therefore they complete through the non price factors like advertising, after sales service etc. With the help of demand and supply schedule explain the meaning of excess demand and its effects on price of a commodity. The above schedule shows market demand and market supply of the commodity at different prices. At the price of 7 and 6 the market demand is greater than market supply. This is the situation of excess demand. There will be competition among the buyers resulting in a rise in price. Rise in price will result in fall in market demand and rise in market supply. This reduces the excess demand. These changes continue till the price rises to Rs. 8 at which excess demand is zero. The excess demand results in a rise in price of the commodity. Market for a good is in equilibrium. There is increase in demand for the goods. 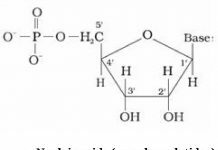 Explain the chain effect of this change. 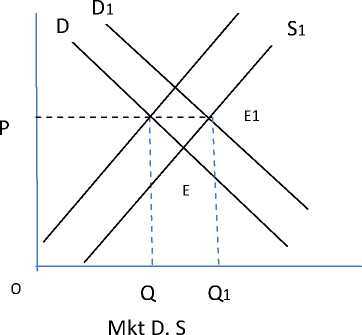 Increase in demand shift the demand curve from D to D1 to right leading to excess demand E E1 at the given price OP. There will be competition among buyers leading to rise in price. As price rise supply starts rising (along S) demand starts falling. Distinguish between monopoly and monopolistic competition. Ans:- i) Under monopoly there is single seller / producer of the commodity. Whereas under monopolistic competition there are large numbers of sellers, so the firm under monopoly has greater influence over price than under monopolistic competition. ii) There is freedom of entry of new firms under monopolistic competition where as there is no such freedom under monopoly. As a result a monopolist can earn abnormal profit in the long run. Under monopolistic competition the product is heterogeneous while under monopoly there is no close substitute of the product. Demand curve in a monopoly market is less elastic than the demand curve under monopolistic competition because under monopoly there is no close substitute of the product. How much loss a firm can bear in the short run? Ans:- A firm can bear losses up to its total fixed cost in the short run. The firms are earning abnormal profits. Will the number of firms in the industry change? Ans:- If firms are getting abnormal profit new firms will enter the industry. If firms are making abnormal losses will the number of firms in the industry change? Ans:- When firms are suffering losses, the number of firms in the industry will decrease as some firms may exit from the industry. Why is demand curve facing a monopolistic competition firm likely to be more elastic? 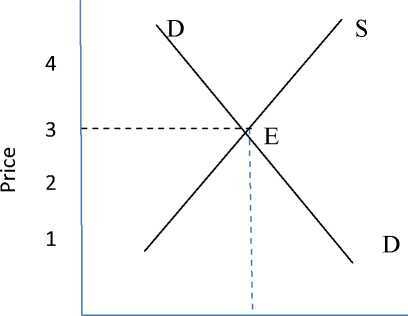 Ans:- In monopolistic competition market the demand curve of a firm is likely to be more elastic, the reason behind this is that all the firm in the industry produce close substitute of each other. If close substitute of any good is available in the market then elasticity of demand is very high because whenever there is a hike in price the consumer will shift to its substitutes. That is why a firm’s demand curve under monopolistic competition is more elastic. Explain how the efficiency may increase if two firms merge. Ans:- i) When two firms merge then there combined efforts and efficiency brings more output to the firm. Increase in the sale of output and economies of scale can be availed. It leads to division of labour and can get advantage of the specialization. Use of better and advanced technology saves the cost of production. In which market form can a firm not influence the price of the product? Under which market form a firm is a price taker? State one feature of Oligopoly. Why is the number of firms small in an Oligopoly Market? Explain. Explain three features of Monopoly. How is equilibrium price of a commodity affected by a decrease in demand? Explain the feature ‘differentiated product’ of a market with monopolistic competition. Draw the Average Revenue Curve of a firm under a) Monopoly and b) Perfect Competition. Explain the difference in these curves, if any. Show with the help of a diagram the effects of an increase in demand for a commodity on its equilibrium price and quantity. 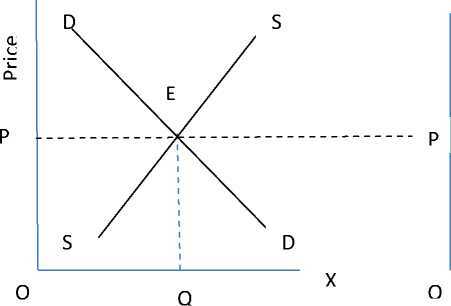 Explain with the help of a diagram the determination of price of a commodity under perfect competition. Explain the concept of equilibrium price with the help of market demand and supply schedules. Given the market equilibrium of a good. What are the effects of Simultaneous increase in both demand and supply of that good on its equilibrium price and quantity? Distinguish between perfect competition and monopoly. Why is the demand curve facing a firm under perfect competition perfectly elastic? Explain briefly the three feature of perfect competition. Explain the chain of effects on demand, supply and price of a commodity caused by a leftward shift of the demand curve. Use diagram. Explain three feature of Monopolistic Competition.